Too Many Things To Do! All my friends seem to be saying it. Where does one begin? One moment I feel like finishing off a particular task. That might make me feel better, but it takes longer than I thought and I haven’t been able to start clambering through another pile of papers as planned. I have more piles on my desk than Trump had when the world was privileged to glance at his desk in the Oval Office. I visualise them as peaks of different sizes to be climbed in different degrees of apprehension, and always short of breath in the fear that I’m losing rather than making progress. My bedside lamp has lost its shade in my confusion of good intentions. Frankly, every evening its two bits of braid hanging down reproached me when I had no time to do anything about them. Getting up in the morning I faced the door and didn’t notice how dejected they looked. The lampshade is still here beside me, waiting. I pursued my good intentions instead and sent off my first letter to an agent with synopsis and 50 pages, all online as requested. Then, while researching another agent, I found good advice on how to write a query letter, and then more advice. And more. I hadn’t done it right and should do this and that and still something else. On return I decided to rewrite my query letter and synopsis. I should research one or two more agents to fill my quota of five applications a week, but my mind won’t stop worrying away at those urgent things that still have to be done. Sorting the books in one bookcase, that was most urgent task, so there is space to tidy books and papers away. A nagging voice in my head said that they would have to be sorted in the future. I have only climbed two peaks. I do feel better, but where has the afternoon gone? 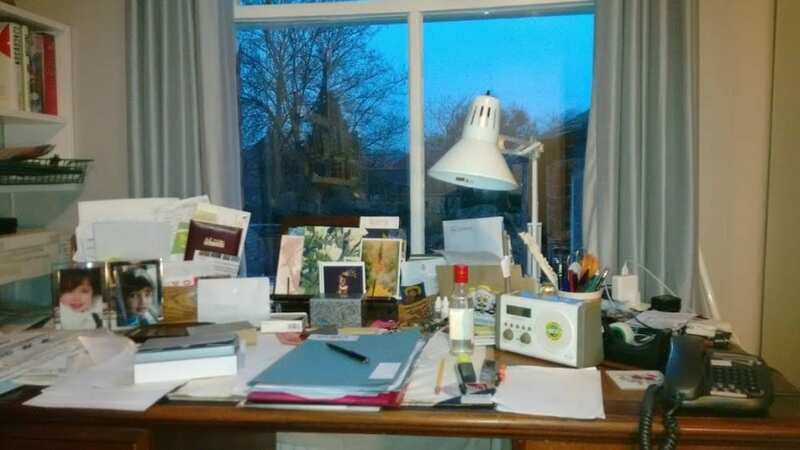 A luxury I yearn for is to come into my study in the morning and see a clear desk to welcome my efforts. At the end of the day I’m sitting there watching the sunset, with papers on both sides craving attention. I dream into the clouds. What a lovely piece ! So you achieved something today ! I know just how you feel though ..it allseems insurmpuntable doesnt it ? Oh dear – yes this sounds very familiar! Maybe this is why people keep going away from home – to escape all those nagging piles of paper. Alternatively, become a president! Other people do your work and you only have to order! You have cheered me up immensely, dear Valerie – I had thought I was alone in trying to ‘manage’ an identical situation….thankyou ! !